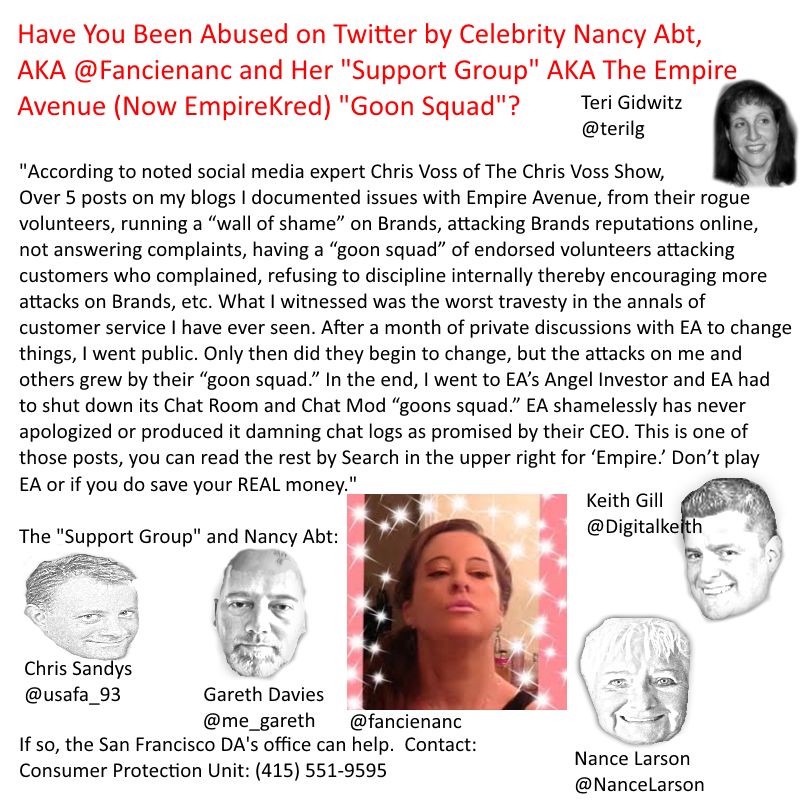 Given Celebrity Nancy Abt’s (AKA #Fancienanc) well documented ability to lie I thought I’d speculate in satirical fashion on things that she and her “support group” (not coincidentally they also seem to be the Empire Avenue “goon squad”) might have done. 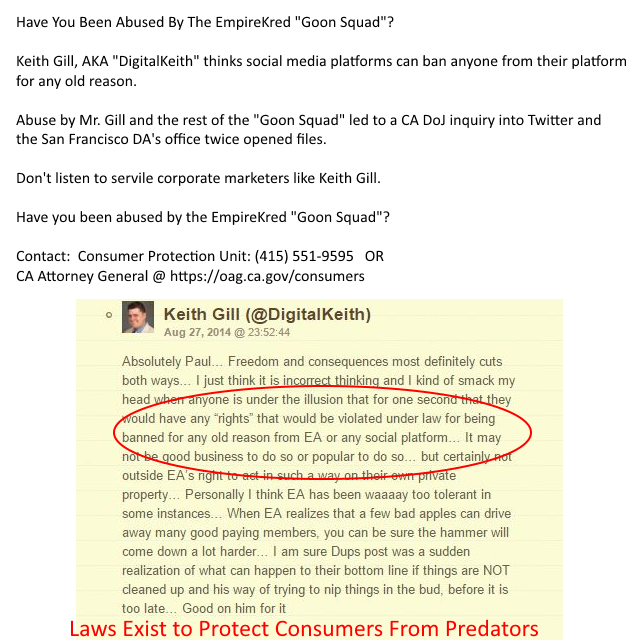 Given that Keith Gill, AKA DigitalKeith has written that consumers may be banned for whatever reason, and have no rights, this seems entirely within the realm of possibility to me. 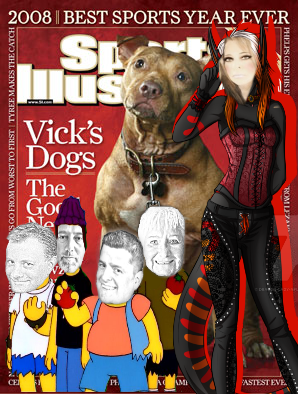 The Dragonlady and her “Support Group” might of trained dogs with Michael Vick. Defiled the memories of Veterans that fought to preserve the rights of all citizens. Appeared on the “Red Carpet” in Hollyweird. 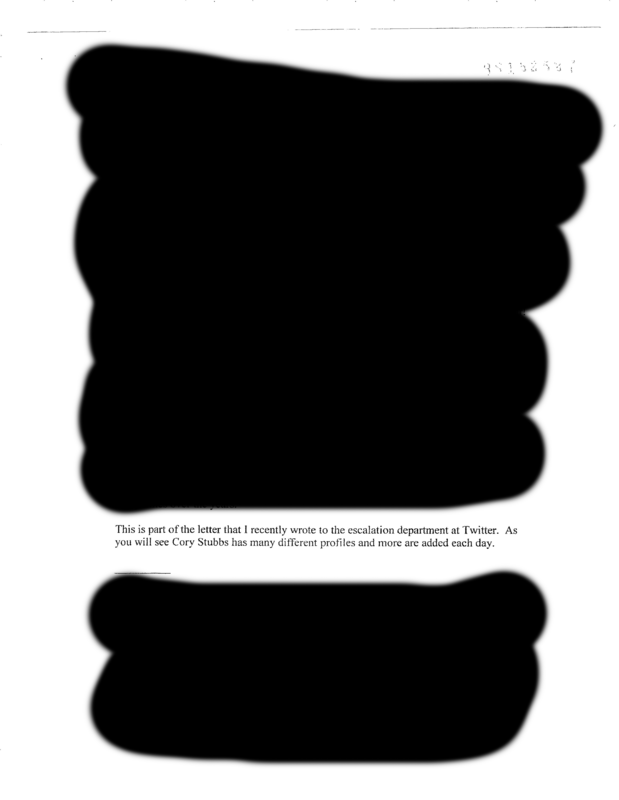 I control who appears in my content. Troll and go. 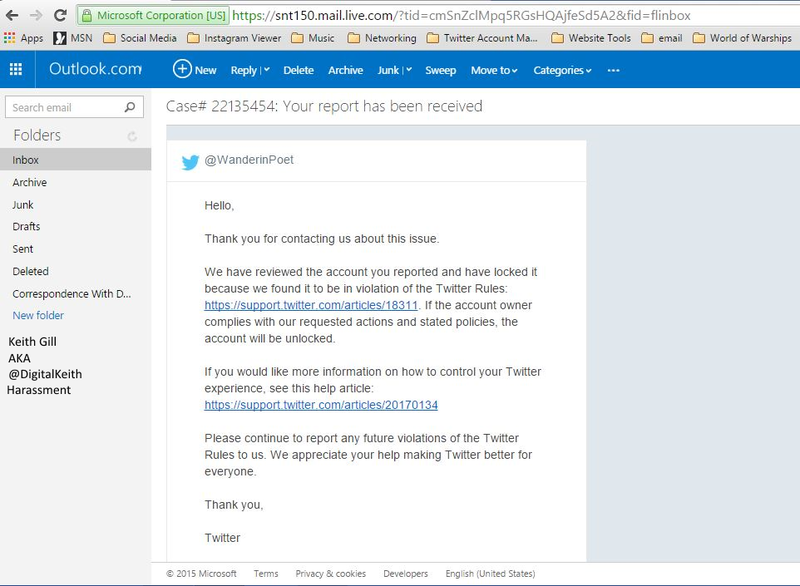 Sorry, troll, but you had to go. And that was your choice. EmpireKred Staff Nance Larson and leaders Gareth Davies (@me_gareth), Chris Sandys (@usafa_93) and Keith Gill (@digitalkeith) are remarkably resolved to attack their own customer. 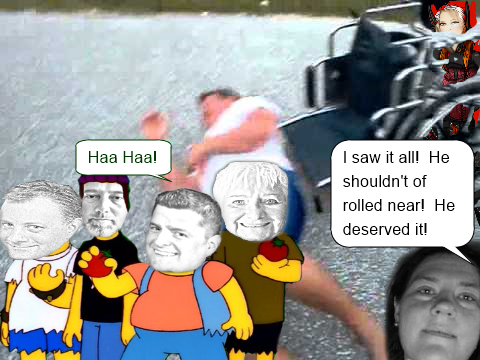 Apparently failing to agree to keep abuse of customers by Leader Gareth Davies (and others) off the records opens you up to “chaos” by Staff and Leaders of EmpireKred, even if you are a customer of theirs. 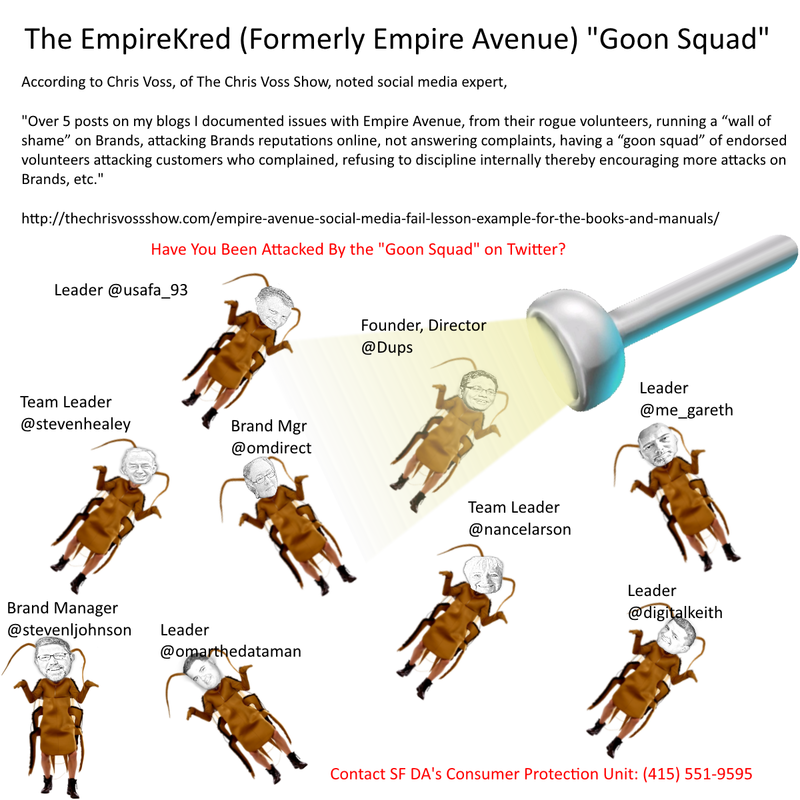 Taken together they seem to comprise the “Goon Squad” first reported on by Chris Voss of The Chris Voss show, customer of Empire Avenue’s, and noted social media expert. 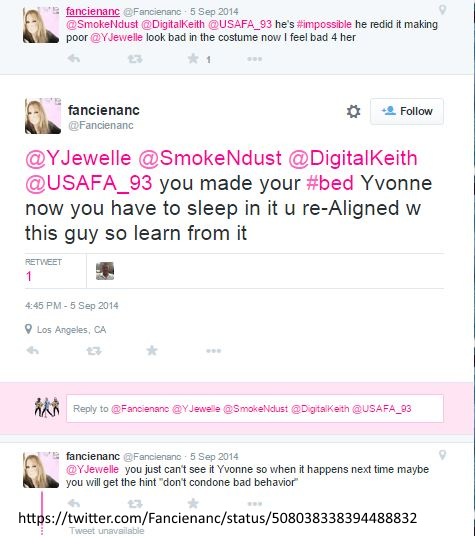 Staff Nance Larson openly lies about her authority on Twitter. 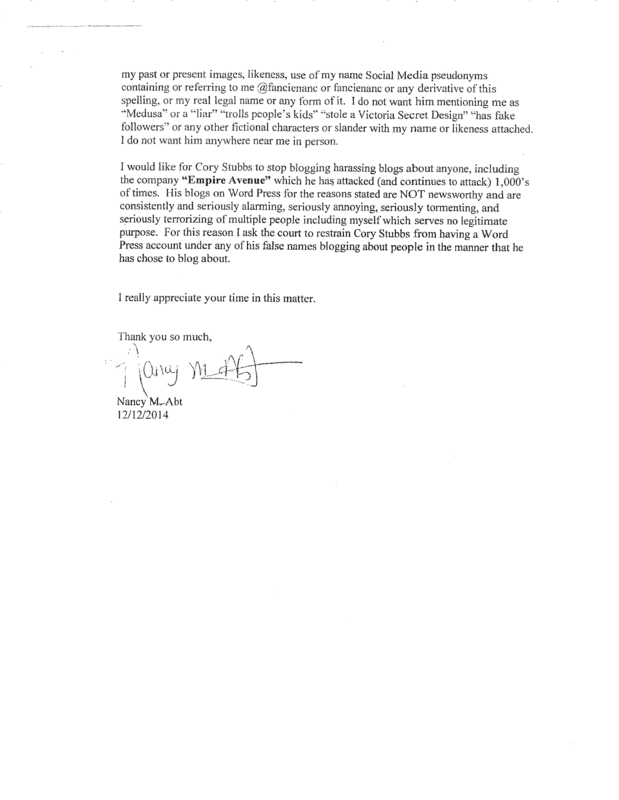 What kind of company has staff that lies about their authority? @wanderinpoet What am I on EK, a wealthy player and what are you? Someone asked what I do on EK. My answer to all is Mind my own business and pay the game like everyone else. 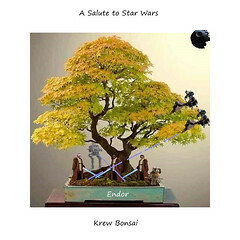 Their very presence at EmpireKred is more than enough reason to avoid EmpireKred. 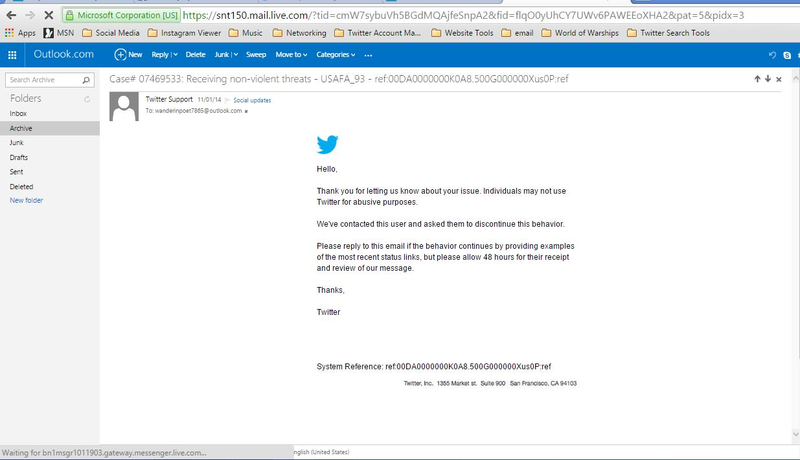 Their methods include false allegations, violent and non violent threats (moderated by twitter) and doxing. 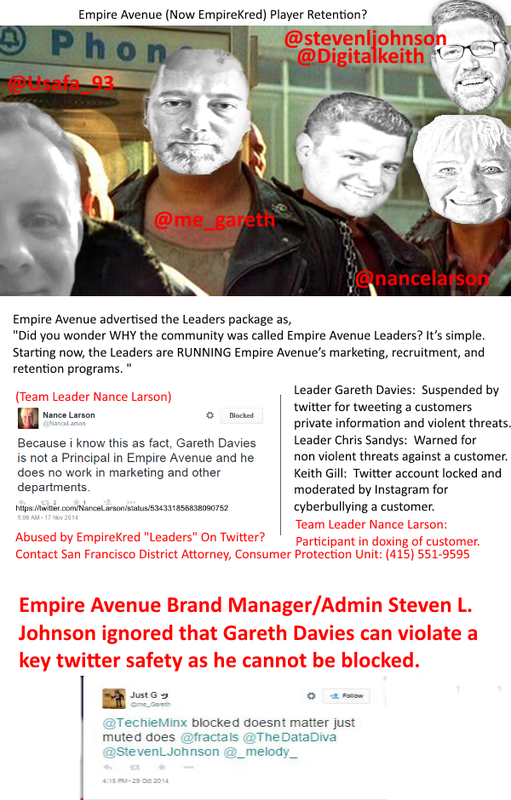 Gareth Davies, leader of Empire Avenue welcomed the reporting on Twitter when I advised him what I was doing. 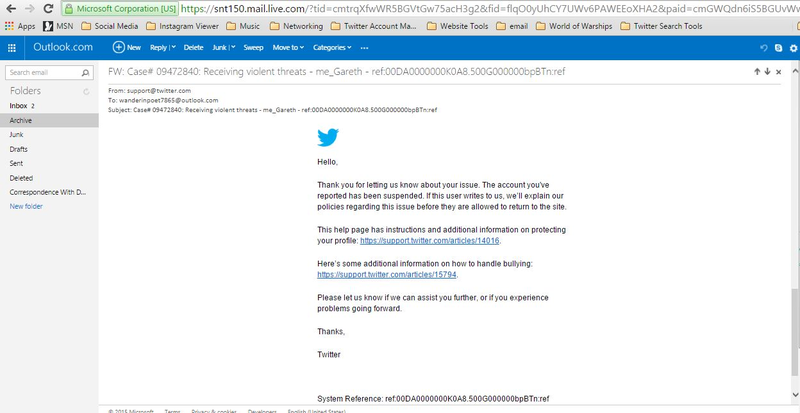 It has resulted in his suspension by twitter for violent threats and tweeting my private information (doxing). 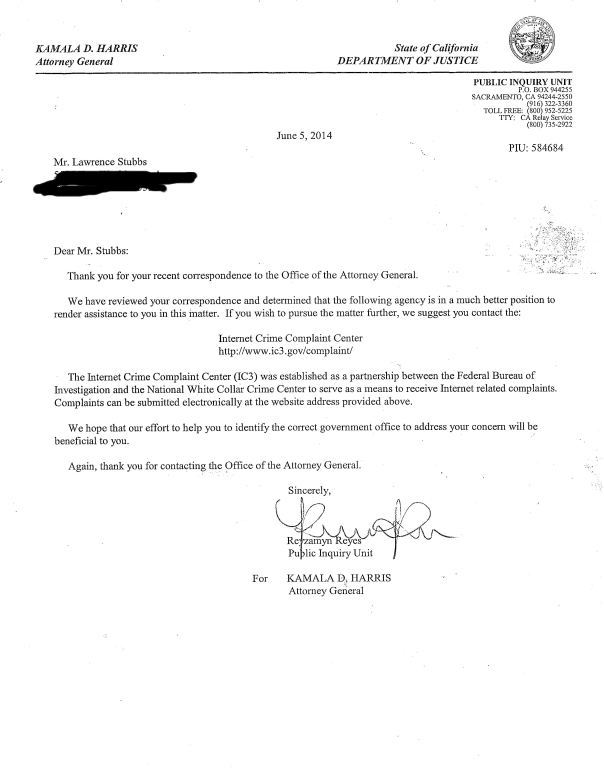 It also resulted in a CA DoJ inquiry into Twitter and the SF DA’s office twice opening files. 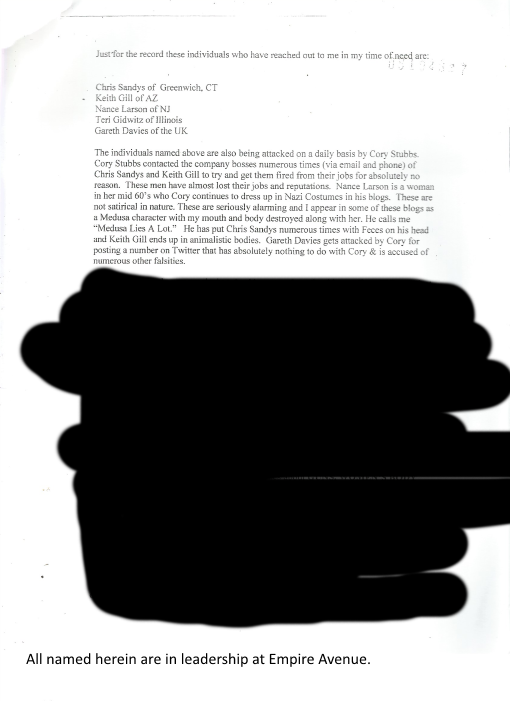 All as I’m a customer of Empire Avenue’s concerned about attacks on other customers. 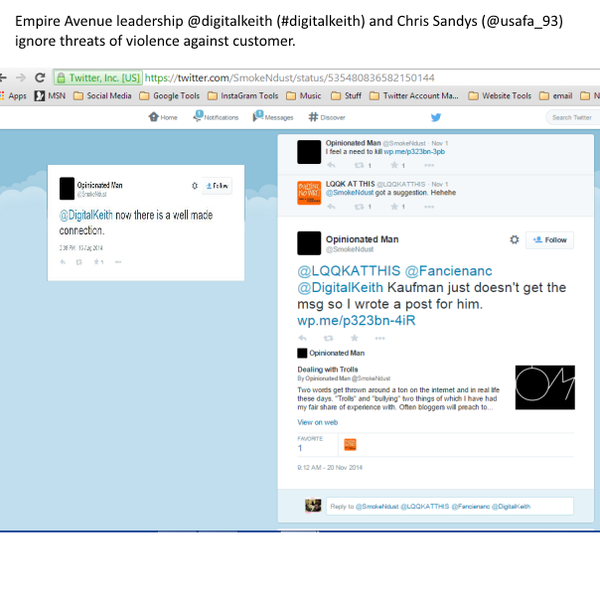 Gareth even tweets his intent to bully myself, a customer of Empire Avenue’s. No reason to find me. 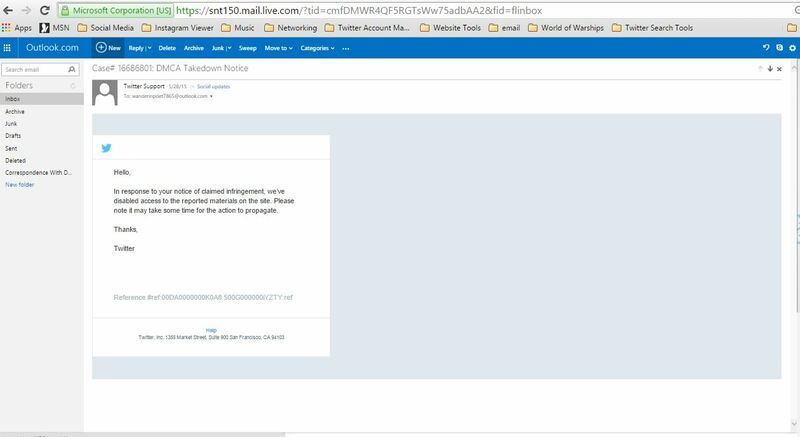 Had Empire Avenue support asked for my id, I would have provided it. They did not. 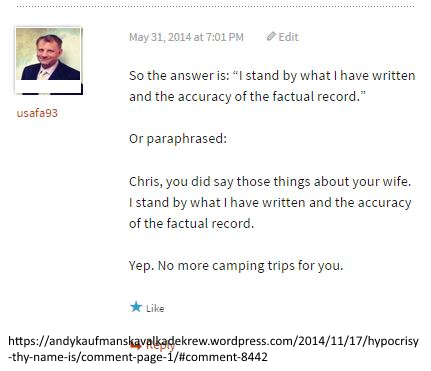 Their tactics seem to include creation of fake accounts that don’t blog to comment on your blog here at WordPress. And #Klout of all things…. Klout? 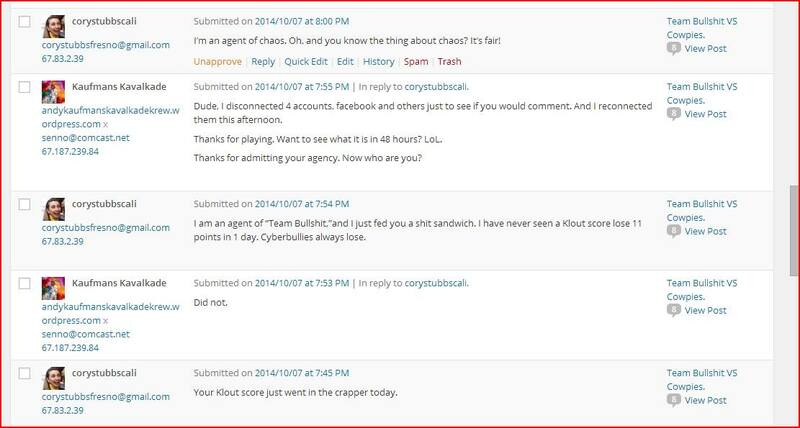 Why test klout? I told Keith how it worked long ago. I can’t help it he’s a stubborn mule and can’t accept new information that doesn’t confirm his preconcieved bias. 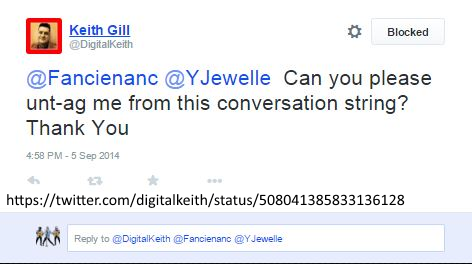 Keith Gill disseminates information he himself questioned the reliability of when he met this strange account. 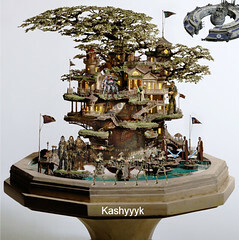 @SyndicateOrder OK who is this? 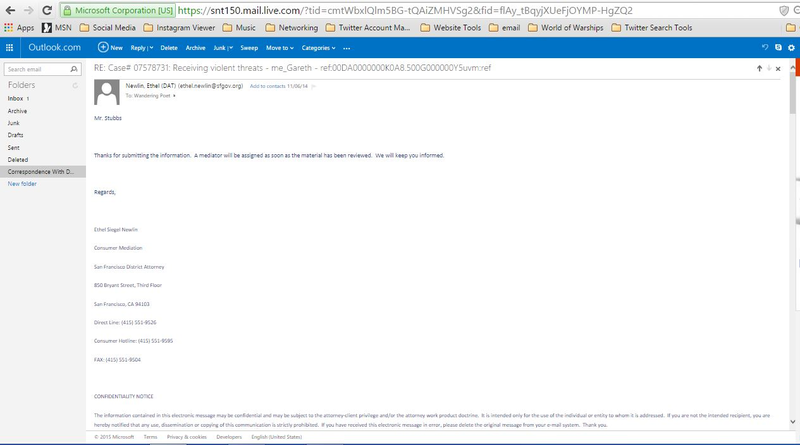 No I would rather you NOT e-mail me… Jeesh why the heck do I attract this goofy stuff? 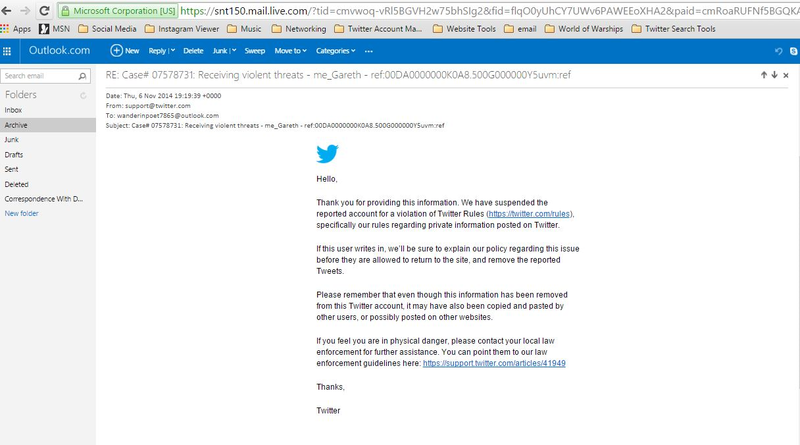 @syndicateorder was warned for violent threats and suspended for non violent threats by Twitter. 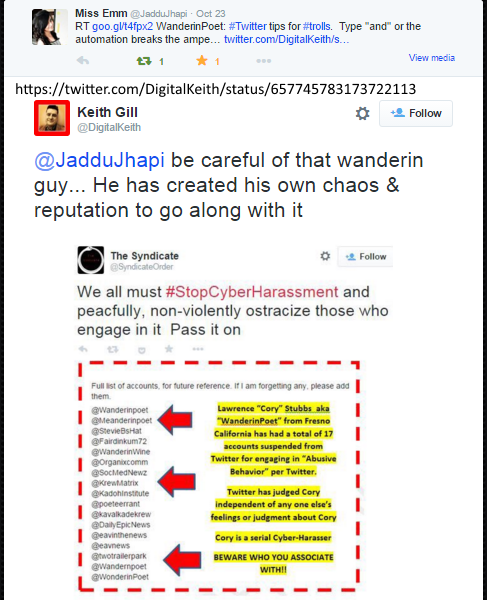 Why would Digital Keith disseminate information from the account he questions the veracity of? 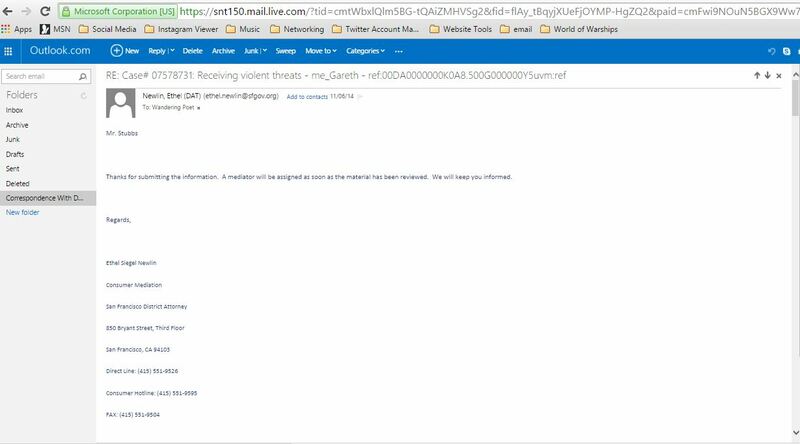 Despite this I continue to receive harassing tweets from Gareth Davies, who has admitted to attacking me, a customer of Empire Avenue’s, when he doxed me and began bullying me on Twitter. Is it still Keith day? 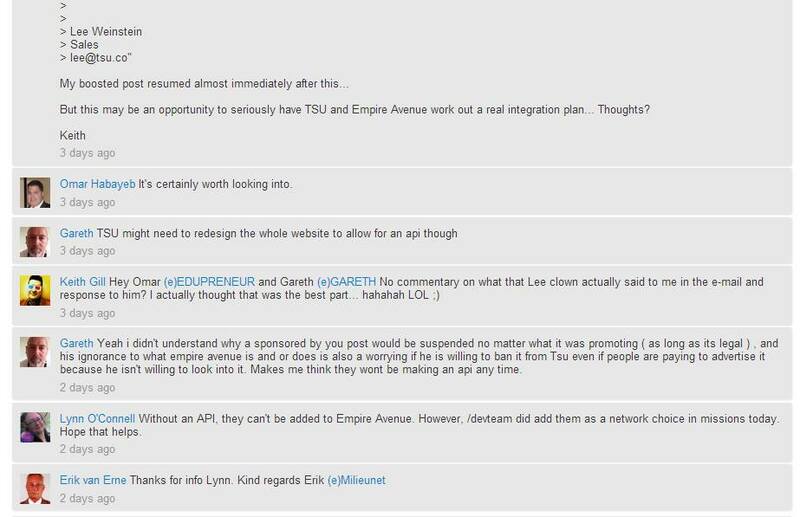 I have no idea why Gareth Davies was allowed to attack people on the Empire Avenue website forums, and why they remain leaders at EmpireKred (Nance is Staff!). And Chris Sandys? Why would anyone listen to his strange rantings and lies on Twitter or at Empire Avenue? Hi, Chris. Leader of a company I’m a customer of. 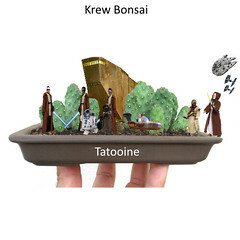 I met you on Empire Avenue…. 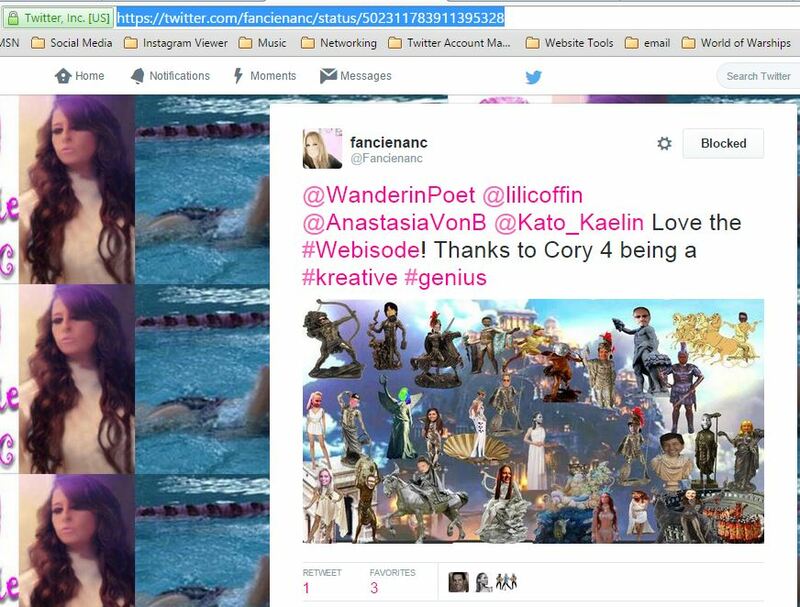 Hello Cory, pleased to "meat" you, hope I guess your name. 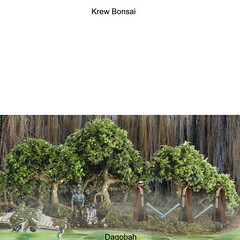 I know the nature of your game. 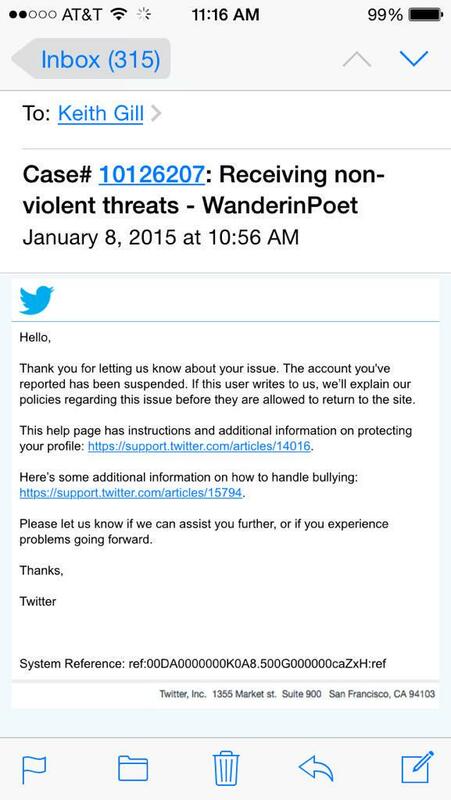 @WanderinPoet @me_Gareth @Fancienanc Principal made clear to you that I have no authority. 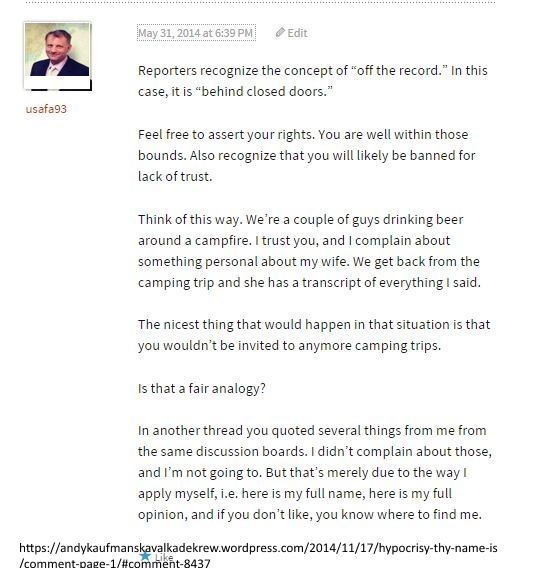 You're just upset that U are to blame for dox. 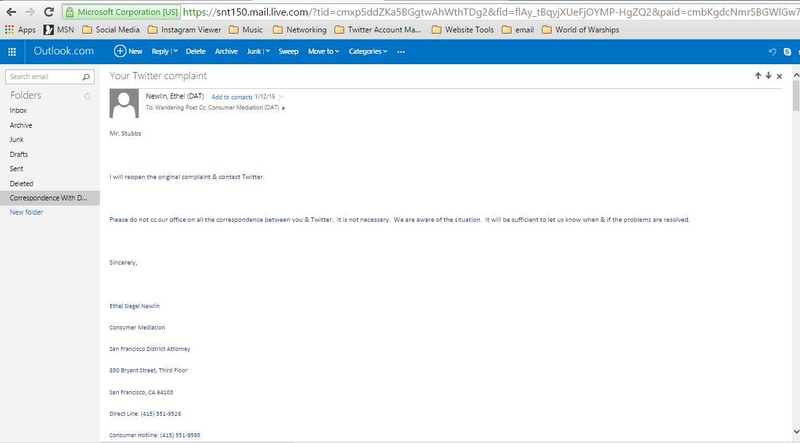 Well, why would a leader of company I’m a customer of dox me on Twitter? 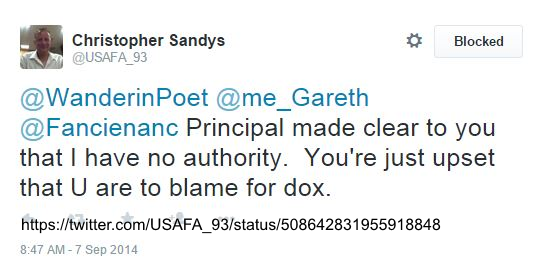 That Chris Sandys has no authority is simply a reflection of his principal’s level of trust in Chris Sandys. That would be nil. No I didn’t. 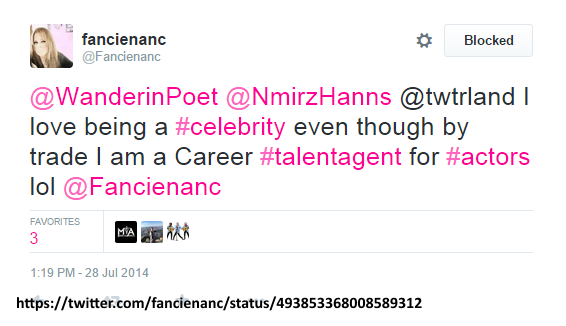 And I’m not an agent. 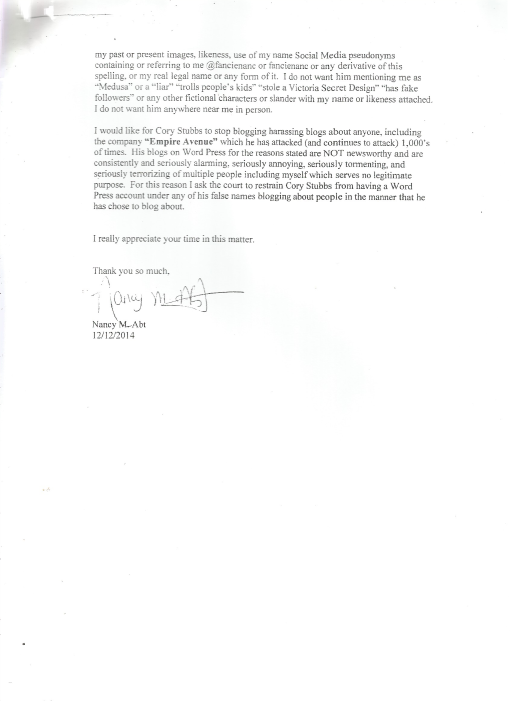 I’m a customer concerned about attacks on other customers. @WanderinPoet @DigitalKeith @me_Gareth No such prohibition. It's only you. It's the world against you. 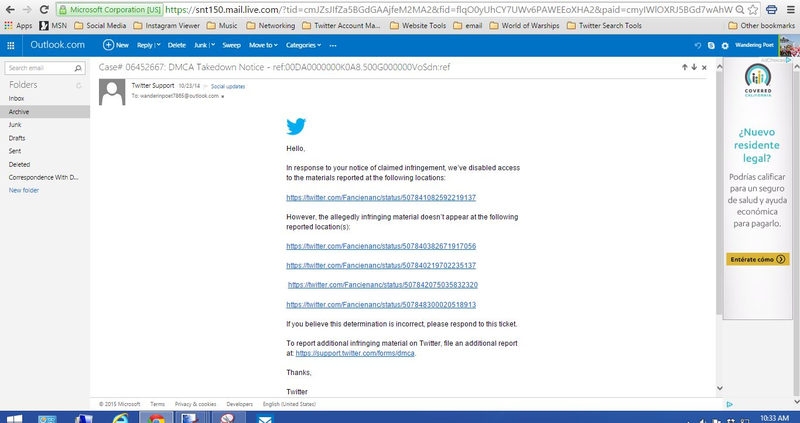 Consumer protection agencies in CA acted to protect my rights and stop most of the “goons” open, extensive abuse on Twitter. And it’s not an attack. HMM. Seemed maybe “awesome” until Febuary 2015 or so when they suddenly stopped suspending me based on whatever Keith Gill was reporting me for. 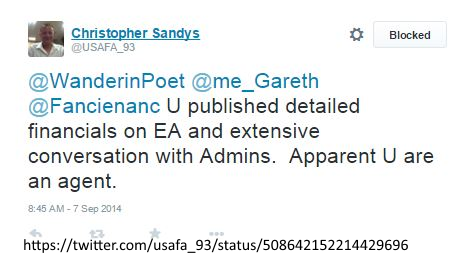 @DigitalKeith @Fancienanc @USAFA_93 @me_Gareth why does only one person have rights and the rest of us don't? 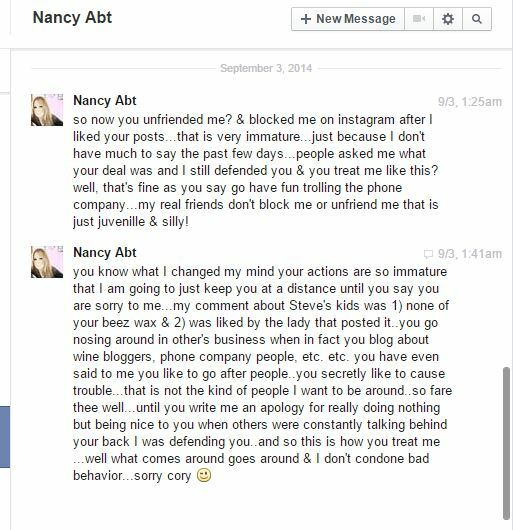 Celebrity Nancy Abt, AKA #fancienanc, has been warned by Twitter for non violent threats. 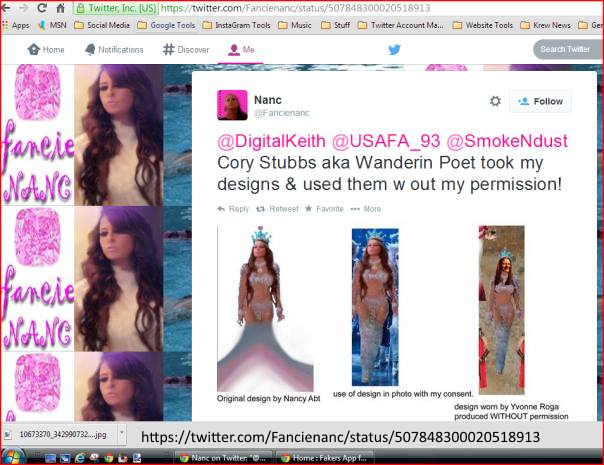 …and falsely claimed a Victoria’s Secret design as her own on Twitter (subjected to DMCA takedown for copyright abuse)…. 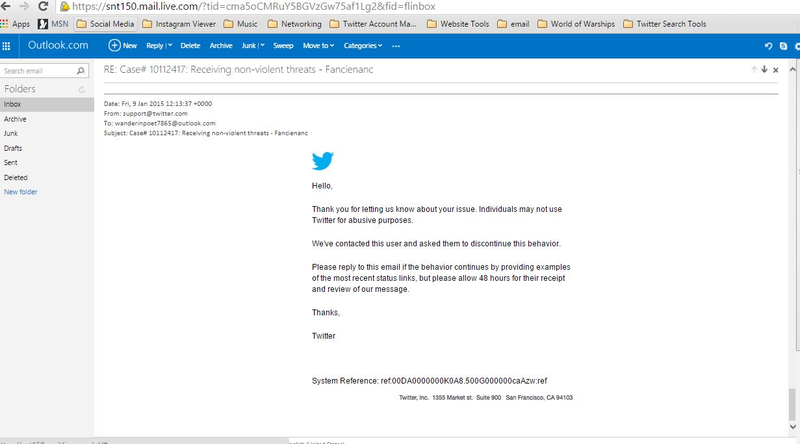 …has been warned by Twitter for non violent threats. 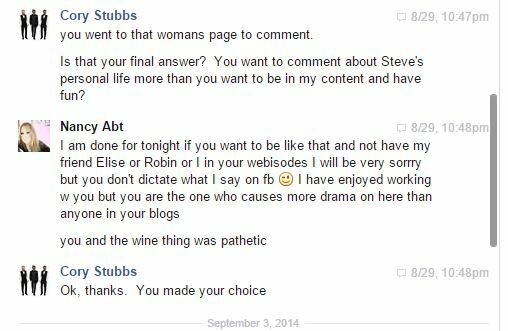 Ms. Abt has a history of tremendously abusing people on the internet, ruthlessly attacking a man and his child on Facebook (for which she was removed from webisode production as a cast member), making mean comments about other social media personalities (Empire Avenue customers even…) and generally being an obnoxious person. 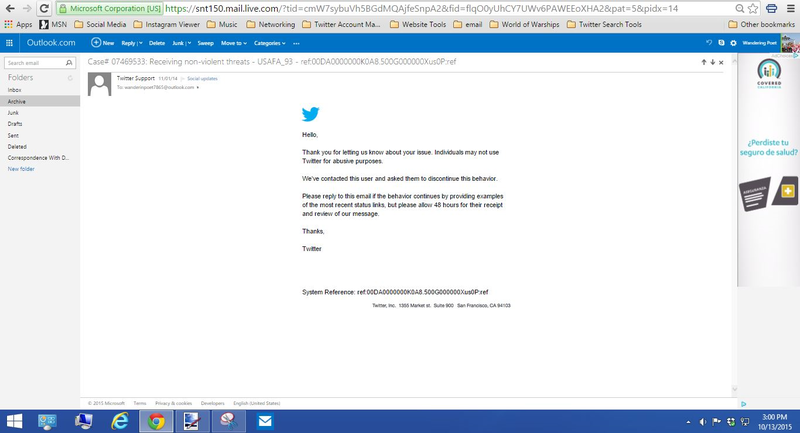 She is strongly suspended of buying Twitter followers, (Status.people is the same applicating relied upon by social media expert Gareth Davies). Despite all this she hopes to become a verified Twitter account. 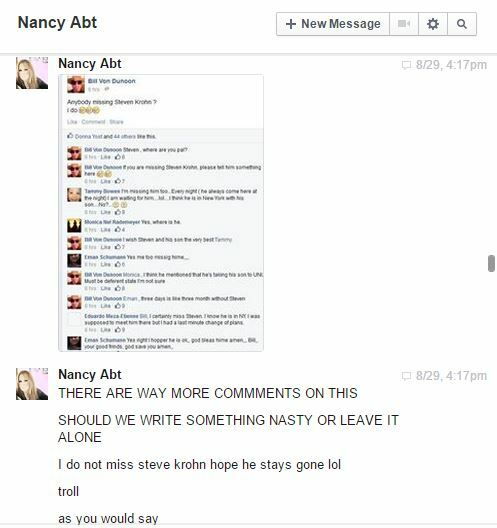 Is that access what allows Ms. Abt to lie indiscriminantly on the internet as she brings her reign of terror? 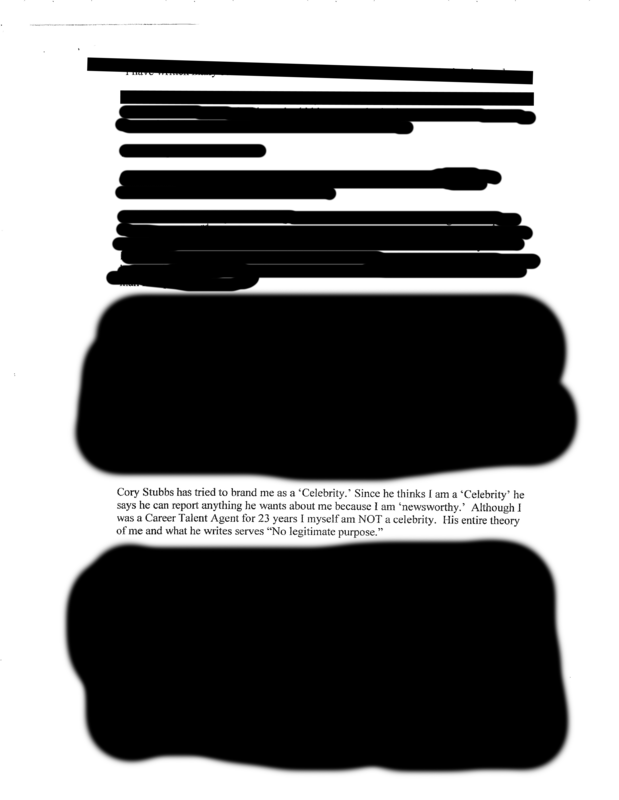 Nancy Abt has gone so far as to deny her own celebrity in court documents. We are glad to bring you your daily Variety. 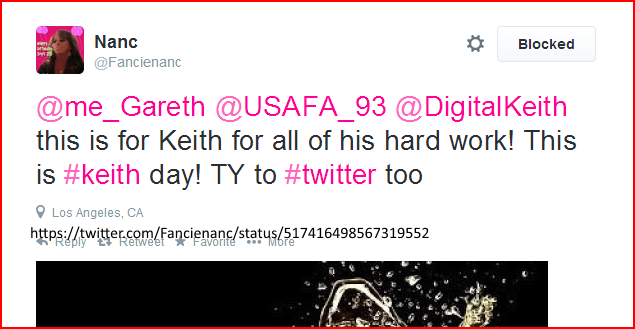 Is it still “Keith Day” in the Abt household? 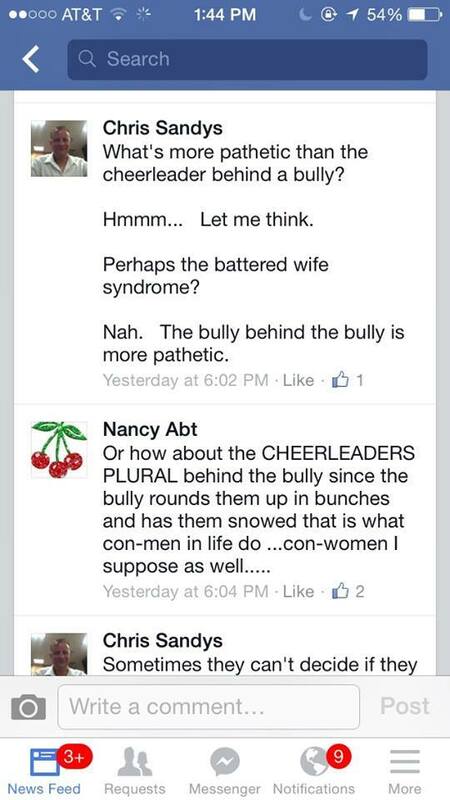 As always Nancy Abt is free to comment here. Please just don’t be abusive this time. 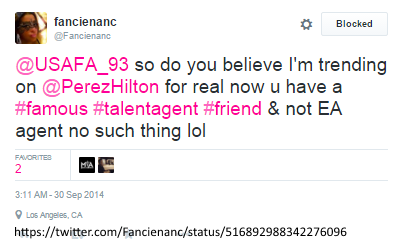 Nancy Abt, aka @Fancienanc is the worst liar I have ever known. 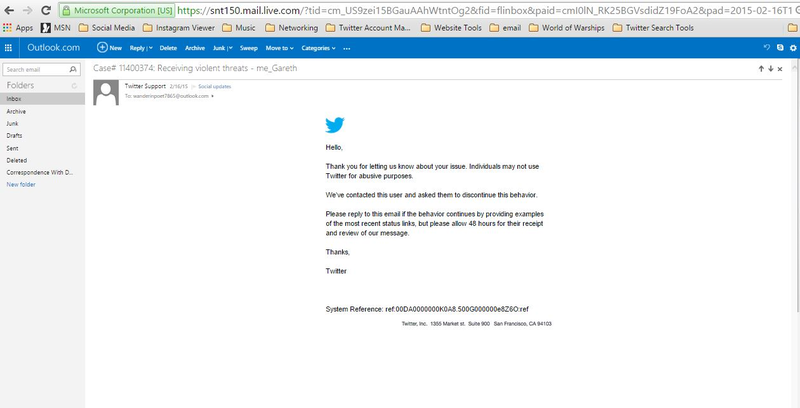 Why she even tweeted tons of tweets to people I know, like @mqtodd and @terrinakamura that she had a restraining order. This is a total and abject lie. Who in their right mind claims a courts authority when they don’t have it? 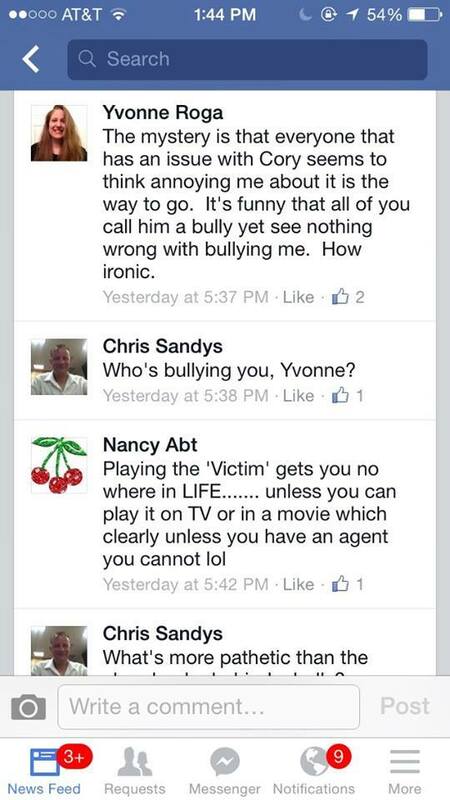 Maybe Nancy Abt should appear on Celebrity Lie Detector? This is astonishingly abusive behavior from a celebrity. Twitter has rules about lying in tweets, but nothing really seems to matter if you’re a celebrity. So for fun, let’s count her lies. I’m using Backtweets to search her tweets to or clearly about me. 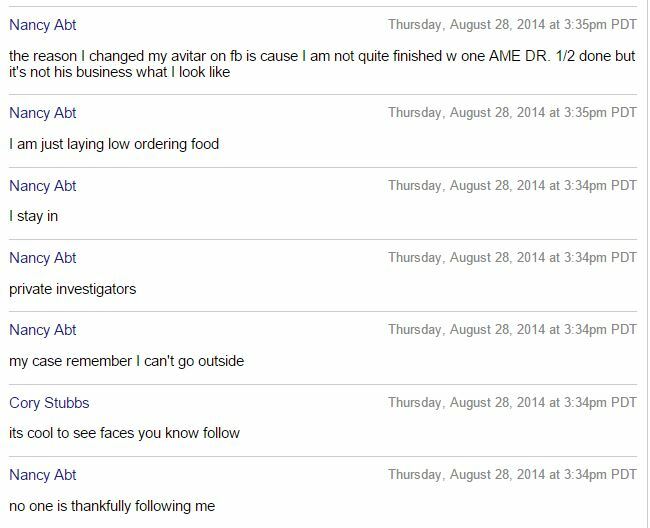 For backgrounds sake, Nancy Abt, @fancienanc is a former hollywood agent who was in hiding from her workers’ compensation carrier, fearing their sub rosa investigators. 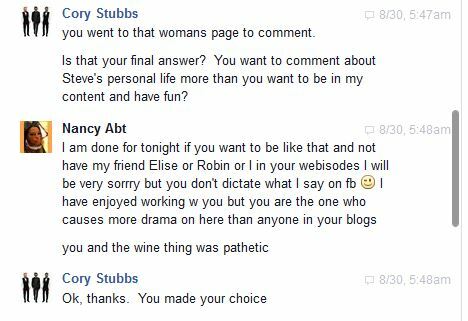 Nancy was in my social media content until I removed her for trolling another person on Facebook. 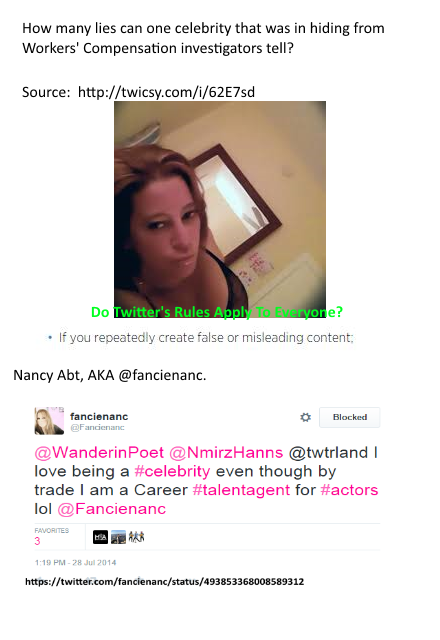 Nancy Abt seems to buy Twitter followers, and cultivates her Twitter following for the celebrity factor as she was paid to advertise. 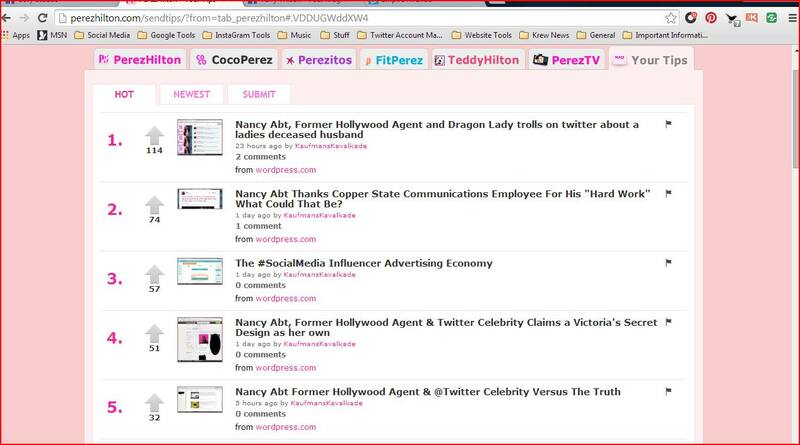 Nancy Abt has trended on Perez Hilton. How many times can one abusive person lie on Twitter? Lies. 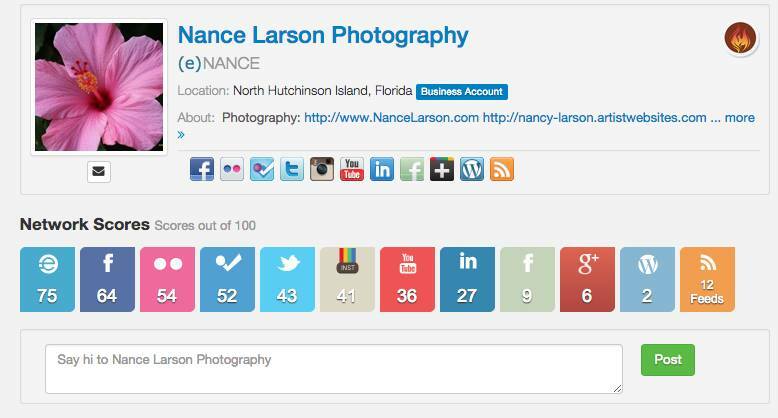 Nancy Abt gave me her headshots on Facebook to use in my content. Needless to say I wasn’t stalking her also. 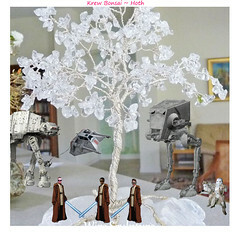 This is a figment of her imagination. I feel it’s an accurate portrayal of her true inner self. 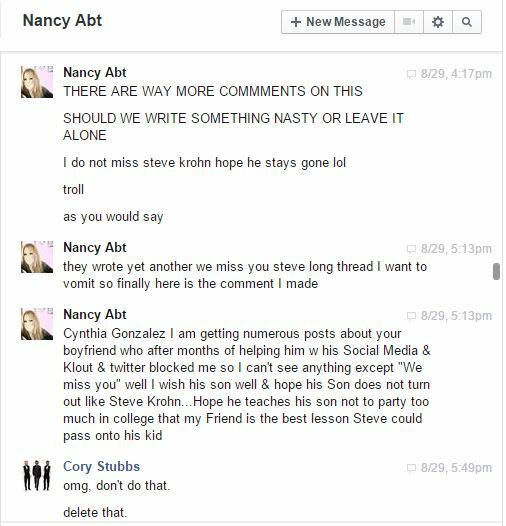 @GracielaABC Cory Stubbs from #Fresno is #stalking #trolling #bullying an entire community on the #internet! We need #media coverage HELP! Lie. 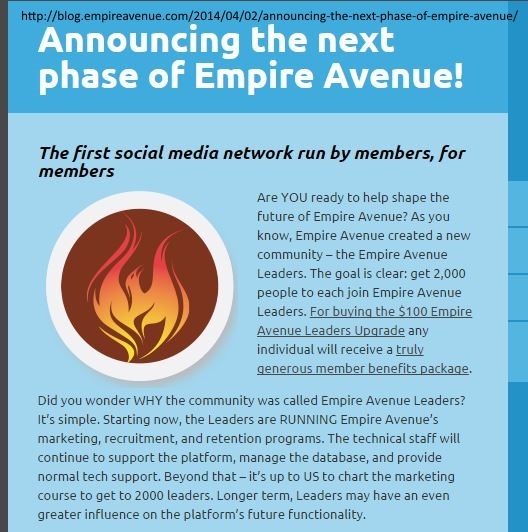 I was blogging about Empire Avenue and their leadership. Nope. The content I create isn’t me. 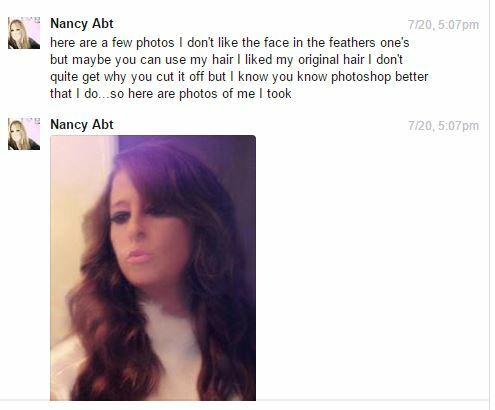 Nancy seems to confuse the internet with reality. 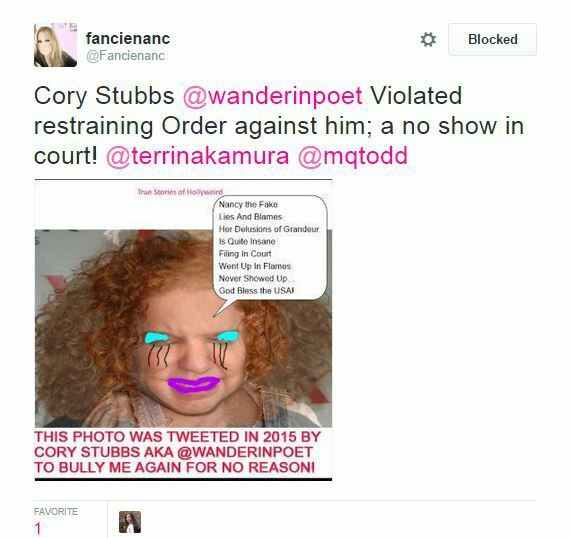 @Frankies_Style I am being #cyberstalker by Cory Stubbs aka @wanderinpoet & I took him to court; he broke the restr order against him! And she didn’t have a restraining order. 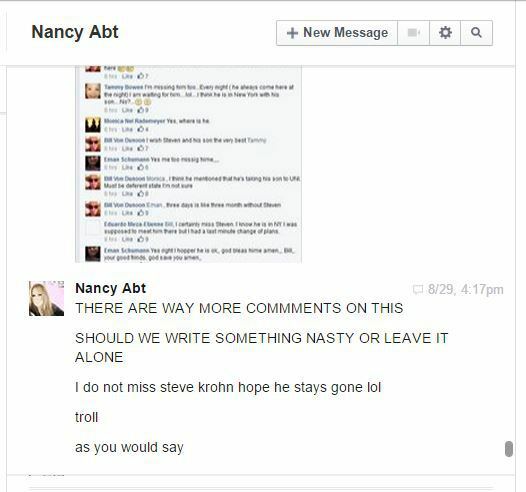 I asked Nancy Abt not to troll. She removed herself by trolling a man and his kids. 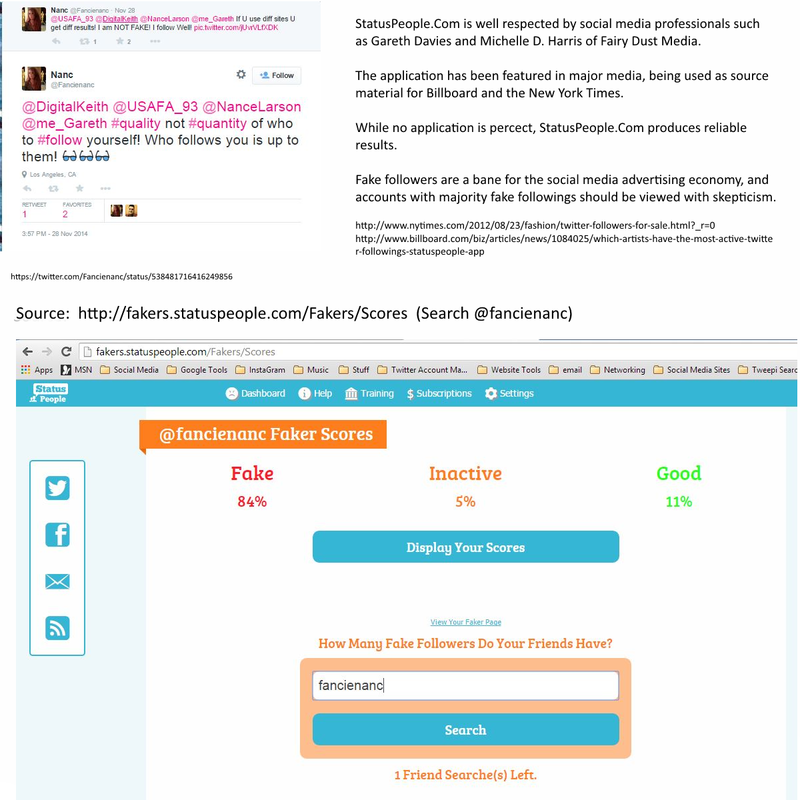 If she’s doing #ads for your brand, watch out! 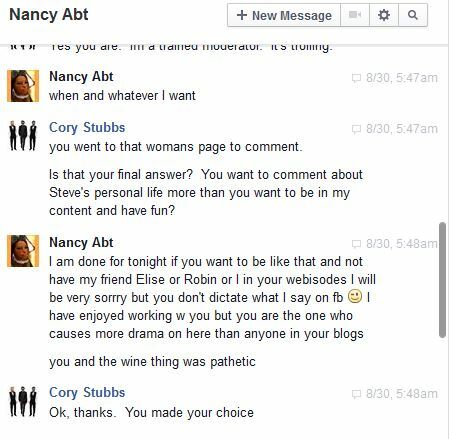 Nancy Abt tried to silence my blogging about Empire Avenue, a gaming company with a record of attacking their own customers. 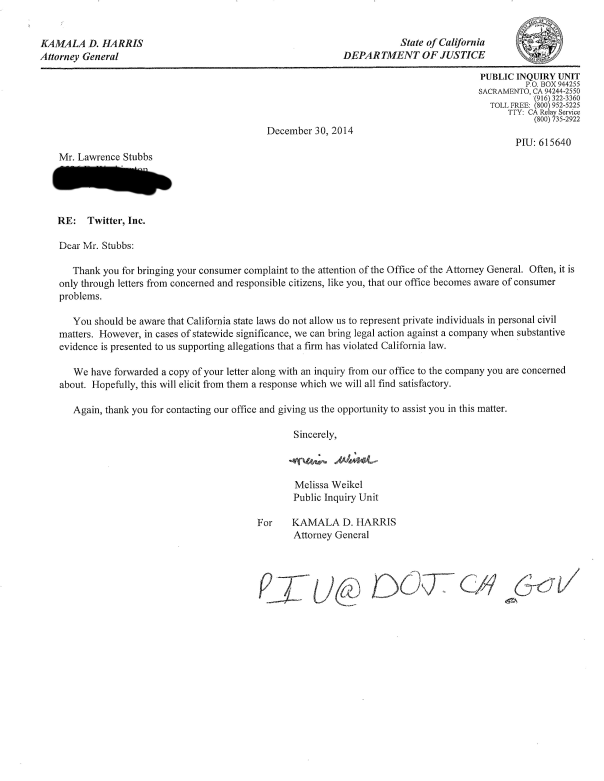 Abuse by Empire Avenue of their customers led to a CA DoJ inquiry into Twitter and the SF DA’s office twice opened files.